On November 9, Charge d'Affaires a.i. 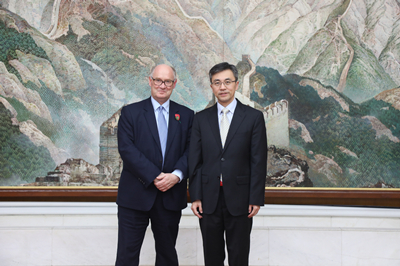 Zhu Qin met at the Chinese Embassy with Sir Douglas Flint CBE, the UK Treasury's Belt and Road Envoy and former Chairman of HSBC Group. The two exchanged views on China-UK cooperation on the Belt and Road Initiative (BRI). Zhu noted that since it was proposed five years ago, the BRI has received extensive support from the international community. It has turned the ideas into action, transformed its vision into reality and achieved positive results. Against the surging protectionism and unilateralism, the BRI is providing an important opportunity for all the countries in the world to promote connectivity and strengthen international cooperation. China and the UK should seize this opportunity to further promote a steady China-UK cooperation on the BRI and bring more tangible benefits to the people of the two countries. Zhu commended Sir Douglas on his active effort in promoting the BRI in the UK since becoming the Belt and Road Envoy, and hoped that he would continue to share his advice and suggestions on the BRI construction and China-UK cooperation on the BRI. Sir Douglas said that Britain attaches great importance to the BRI. He hoped that the BRI could achieve high standard and high quality development and strive to become an important platform and a signature brand for international cooperation. He offered to continue to work for China-UK cooperation on the BRI so that the BRI could deliver more benefits to the world.